You have a “master” within you that has the ability to write songs that are so good you’ll have to hear them to believe it. At this stage that may sound a little “far out” to you. But as we go through this article you’ll learn the reasons why it’s true… and also how you can make a reality and discover this “master” that lurks deep within you. Everyone has a strong opinion of what music should be all about. Everyone has a strong instinct for musical composition. You know what type of music you like don’t you? You may not know exactly how to take their music and make these changes yourself… but you DO have an idea inside you of what PERFECT music should sound like. Well, the important message behind this article is that you can TAKE this idea of PERFECT MUSIC and use it to direct your musical efforts. And as you use this “idea” of perfect music, in combination with some of the techniques I’m going to tell you about, you’ll head towards achieving this amazing music with a full head of steam. The beauty of this is: If you can reach the destination… if you can create music that you feel is absolutely “perfect”, hordes of music lovers will love your music. They will buy almost anything you put out. They will discuss you to their friends and family. Because unique, inspiring music is RARE! Yes, there are many wonderful musicians out there in the world. Many that have probably even changed your life in some way or another. But the vast majority… The 99% of musicians… Unfortunately don’t write songs driven by their own, strong opinion of what music means to them. You CAN do this however. And when you do you will carve a niche, so unique and inspiring that you will easily develop a passionate fan base of thousands of people. Well, let me give you an overview. As I mentioned, you need to allow this idea of “perfect music” to consume you. Now when you think of “perfect music” you may not get a crystal clear idea. It may be fuzzy. Maybe a little cloudy. But you will notice subtle little perceptions… ideas… and understandings. A certain “style” of playing may come to mind. Certain lyrical themes. Colors may flash into your mind. Many other subtle hunches and urges will arise. You must pay CLOSE attention and take NOTE of all these things. This is your UNCONSCIOUS MIND responding to the question that you’ve just asked (What is perfect music? ), and within these perceptions and ideas that arise is extremely meaningful information. When you do this, write down everything that comes to mind. And I mean EVERYTHING. The truth is that the most important ideas won’t come in the form of words. There will be sounds… colors… even feelings. Use diagrams… pictures… sentences…. Anything you can do to describe what you’re noticing. Once you’ve done this for 10 minutes or so, you’ll have a much better idea of what your own personal “perfect music” is. There is more involved in creating a strong, passionate VISION for your music… but this should get you off to a fine start. If you want the full picture, be sure to check out The Songwriting Genius Within You. This course contains everything you need to develop a strong vision for your music, and the tools to “create” this vision. Ok, so why have you just created this idea of “perfect music”? Well there are many powerful reasons. Firstly, you were born with a natural instinct for music. You’ve just “drawn out” some of this instinct and put it into words in the previous exercise. You will create your BEST MATERIAL if you follow your natural musical instincts. If you try and go down a different path, you’re cutting off much of your potential instantly. But head towards your idea of “perfect music” and you’ll find that you’ve got what it takes to get there. Your brain is a tremendous resource and you’ll find it has the resources and expertise to bring this vision to life. Also, a side benefit is that you’ll LOVE the music that you write. I mean, you are creating your very own brand of music, driven by the idea of what music means to you! Finally, perhaps the most important reason for becoming clear about your idea of “perfect music”…. Probably the human brains greatest ability is this: It’s a powerful goal achieving device. If you set a goal for yourself, and have the passion to stick with it, your brain will work tirelessly until the goal has been completed. Well, you can harness this power to make your musical vision come to life. And part of achieving a goal is actually SETTING it! The exercise you just did began to FOCUS your mind, instructing it that this is important to you. So now you have begun developing your VISION, what next? Well, you need to use the power of your mind to begin creating this vision! The most effective way to do this is to use proven “techniques” that harness the full power of your mind, which creates ideas that support your vision. There are actually songwriting techniques that will “draw out” your most brilliant abilities that are buried deep within you. Socratic Method for example has been proven to produce “geniuses” at a rate of 10 million times that of present day teaching and development methods! Yes… but unbelievably as that may sound, these methods work to astonishing affect. A few years ago I published a special course to help musicians “tap into” these miraculous abilities, and ever since this, the hundreds of musicians who have taken the course continue to dig deeper into their potential, getting more and more amazed as the journey continues! You can use the techniques in this course too, which will allow you to easily fulfill vision that you’ve created for yourself while reading this article. It’s a journey that will fascinate you, and the rewards for undertaking it are mind boggling. 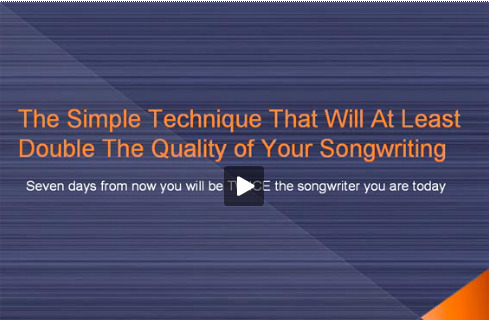 You can discover The Songwriting Genius Within You by clicking here.